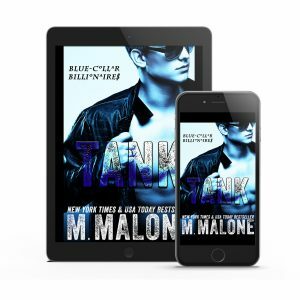 Want to read TANK for free? I’m angry. All the time. There’s only one person that keeps me anchored in the midst of the chaos. One person untouched by violence and money and lies. Emma Shaw. But if there’s one thing I’ve learned, it’s that when money is at stake, the only person you can trust is yourself. The sizzling first book in M. Malone’s USA TODAY bestselling series about the true bonds of brotherhood.